I am in the process of looking to have quarter light seals reproduced. The ball has just started rolling but and I mean a HUGE BUT, I need a mass show of hands before anything can happen. Please can I have names of interested parties that I can add to a growing list? Mick, I think I have USED good samples for the rear - but would need a guarantee of getting them back. I don't need any new ones front or rear. Let me know if/when you need the samples. The rears are much, much simpler than the fronts, in fact I'm sure they're not handed. Have you read this thread? Interest was canvassed here too and I doubt it has changed much, but don't count Jon Tilson's interest; he couldn't wait. I'm not trying to discourage you, it may save you repeating steps already covered, especially if the company you are approaching is one of the ones that have already been approached. I am genuine on this matter, I would pay you for the samples far more than they're worth up front. All I would want is the money back in return. Thanks xviIvalve, the company I have approached are a very well known establishment that I know you would be familiar with. My project would not be complete without having those finishing touches in place. 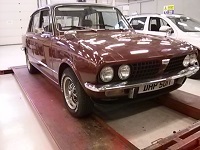 Firstly, I need more importantly is Dolly/Toledo owners to show there hands to indicate interest. On reading this, I am looking like some dodgy Arthur Daly!! No money needs to be parted with until I can prove the interest and then all can be revealed. Sorry Bill, but the fact that there are 2 part numbers for the rear seals would tend to indicate that they ARE handed! The front ones are DEFINITELY handed. As I said in the post mentioned above, i'd be up for 4 fronts and 2 rears, so long as the prices weren't ridiculous. But we also need to source the rivets you have to destroy to change the front seals. Something Murdo DA McCloud has been attempting to do lately without significant success! The rears are handed as the bottom chord has a lip that seals over the top of the door, but they are a much simpler shape as the rears don’t open and there is no quarter light frame which effectively passes through them at the hinge point as on the fronts. The point about the rivet is crucial; without a rivet you’d not be able to fit a replacement and the fronts and a rivet should ideally be supplied as a kit. I’d suggest the manufacturers are supplied with at least a 1/4 light frame so their prototype can be test fitted before an order is confirmed. has anyone got a pic of this rivet? Im not sure where it goes lol. As Alun points out, they've been other threads and I think I've already shown an interest quite a few times! Picture I took of the hinge and rivet for Murdo on FB. Ah ok its not a show stopper then. A decent aircraft quality bolt may do the job? Interscrews perhaps? Surely they were only riveted for ease of manufacturing and even so, solid stainless steel flat head rivets seem in plentiful supply or am I missing something? Again, depending on price, two car sets here.